We do not have an Elf on the Shelf, but I had an interesting idea for those who have one. What if one night the elf takes some of the child’s old toys away with him/her up to the North Pole. The story can be that Santa is going to refurbish the toys to give to other children. 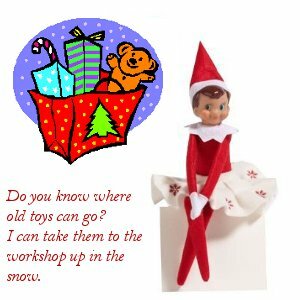 The elf could leave a note advising which night it was going to happen so the child could help pick out the toys that would be going. This not only downsizes the toy collection before the influx of new toys but also explains why Santa gives commercial toys and also opens the door for Santa to give used toys for Christmas. The elf could bring a little note back from Santa that says thanks. Here’s my silly little poem for the elf to deliver ahead of the day the toys disappear. Do you know where old toys can go? To give to a child younger than you. And maybe some books that you no longer read. And on <12/22>, away they will soar. And give them to Santa, so merry and droll. Then give them to others as he spreads Christmas cheer. This entry was posted in Kid-related. Bookmark the permalink. EXCELLENT idea! I am going to have our Elf leave this note tonight – along with a very small, plastic noise-maker for each child to celebrate once they have successfully gathered 3 boxes of toys (1 each). Thank you for the clever note above!